Guests Love Our Hotel's Location in Anderson, IndianaImbued with the rich heritage of the Heartland, Anderson offers a combination of modern convenience and historic charm to visitors staying at the Holiday Inn Express Hotel & Suites Anderson.Corporate travelers can use the on-site Business Center anytime, and our property also boasts a 400-square-foot meeting room. 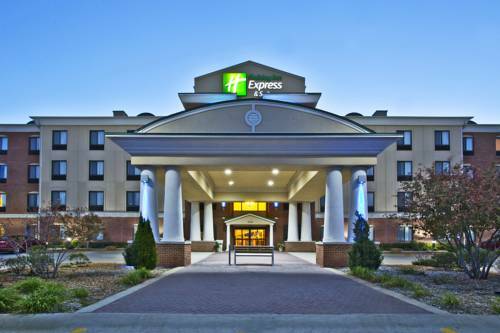 As one of the leading hotels in Anderson, Indiana, we feature an excellent location close to several area businesses, including Nestle. Anderson University and Ball State University are also situated near our hotel in Anderson, IN.Our hotel's guests should be sure to spend a day exploring the beautiful Mounds State Park, which features ancient Indian mounds. Area visitors can also catch a show at the Klipsch Music Center or tour the Anderson Center for the Arts. If you're looking for some excitement, we suggest you stop by Hoosier Park Racing & Casino or visit nearby Indianapolis, about 45 minutes away. Gaither Family Resources is also a favorite attraction for our hotel's guests in Anderson, Indiana.We are proud to offer free Wi-Fi access and we also serve our complimentary Express Start hot breakfast bar each morning. After a busy day in Anderson, IN, our hotel's guests can relax in an indoor pool or enjoy a workout in the Fitness Center. We look forward to seeing you soon! Mediterranean Cuisine. As guests enter the restaurant, they'll find themselves in a welcoming atmosphere with Egyptian ambiance. Menu, buffet and take out available. Classic American diner! Not the fanciest place around, but that is kind of the point. Classic American Diner.....cheeseburgers, french fries, onion rings. Kroakerheads is a local bar offering a variety of menu items, pool tables and music. Children's program - Mounds State Park is located nearby and offers a wide variety of outdoor family friendly seasonal activities. Newest golf course in Madison County / Anderson, IN. Golf course meets PGA rigid specifications. Gaither Family Resources is a place of creative solitude and real community while providing an incredible array of books, gifts, art, home decor creative toys and Homecoming music to visitors traveling from all over the world. The Anderson Speedway provides amazing asphalt racing on a historical quarter mile oval. With races every weekend, you and your family are sure to have fun. Seasonal attraction. Rich in history and recently renovated, the Paramount offers residents and visitors unique entertainment options year round. For nearly 84 years the Paramount Theatre Centre has inspired with its architecture, entertainment, and history. This World's largest private collection of James Dean-abilia, with thousands of items on display for fans of the 1950s actor. A big outdoor sneaker and other indoor memorabilia decorate a basketball-happy motel. Highlights include a real autopsy room and a room filled with brains in jars. Abby Normal! The final resting place of Nancy Barnett, whose relatives didn't want her grave to be moved when the road was built.